Here is the cover that we placed over Sammy's isolette. It protected him from the noise and intense light and may have been a factor in him not developing retinopathy (blindness from prematurity called ROP). He never even had Stage I ROP which is amazing considering his extreme prematurity and the extended time on the vent with high oxgyen settings. 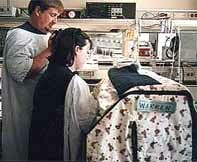 The inner layer of fabric was a dark navy which kept the inside of the isolette very dark and "womb-like." The outside was a teddy bear fabric. I was having a difficult time sleeping when I wasn't at the hospital, so I worked on cross-stich between calls to the hospital and pumping sessions. I cross-stiched Sammy's name and placed it on the top flap of the isolette cover. The cover had a flap that could be lifted for full view inside the isolette. The port holes for hand entry were not covered. The back of the isolette had a flap which allowed for ventilator access. The ends had slits in them which provided access to the portholes for any tubing. 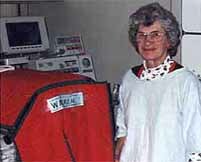 Grandma Warren even made a Christmas isolette cover since we spent that entire Christmas season in the hospital. The inside was dark green, and the outside was red. Dorothy is a wonderful quilter and crafter. If you would be interested in hiring her to make a cover for you, please contact me and I will see if she is available. Here is the pattern that was designed by Susan Warren and constructed by Dorothy Warren. 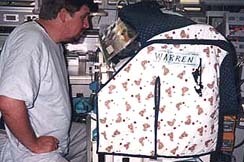 Copyright Susan Warren 1998. The original story, pictures, art and tiny feet background contained in the web site are not to be copied which is prohibited by law.